High profile Meeting on Turkey-EU cooperation on counter- terrorism. ENC organised the first civil society dialogue on counter terrorism between Turkey and the European Union (EU) on June 9, 2016. The event included panel speakers from Turkey and the EU’s leading civil society groups, as well as high-level representatives from the Turkish Ministry of Foreign Affairs, European External Action Service, Turkish Police Academy and Directorate General for Migration Management. 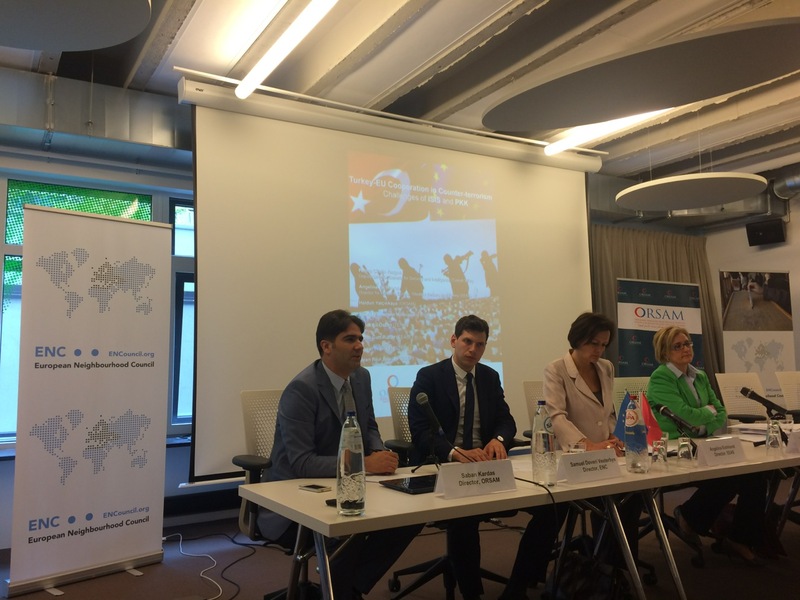 “Turkey-EU Cooperation in Counter-terrorism: Challenges of ISIS and PKK” was held in Brussels on the 9th of July, one day after official counter terrorism talks between Turkey and the EU ended with successful progress. The two expert panels brought together a group of civil society counter terrorism experts and high profile speakers from academia and EU institutions from both Turkey and the EU. The event was hosted by the European Neighbourhood Council (ENC) and the Center for Middle Eastern and Strategic Studies (ORSAM). Among the distinguished participants were Fatma Ceren Yazgan, Deputy Director General for Security and Intelligence at the Turkish Ministry of Foreign Affair and Angelina Eichhorst, Director for Western Europe, Western Balkans and Turkey at the European External Action Service (EEAS). Both pointed out the need for more cooperation between source and transit countries of foreign fighters in order to further prevent radicalization. Ceren Yazgan from the Turkish Ministry of Foreign Affairs noted that radicalization should be seen from a holistic approach and said that religion was not the main contributor, while other important root-causes naturally included psychological and socio-economic factors. The event consisted of two sessions, the first one dealing with foreign fighters and ISIS and the second one focusing on the concept of ethnic radicalization by examining the case study of PKK. ISIS: a complex issue beyond religion. The first panel discussed the complexities of ISIS and foreign fighters in the Middle East, as well as fringe-sympathiser groups in Turkey and across Europe. Joost Hiltermann, Program Director for Middle East and North Africa at the International Crisis Group, ranked the five main components of ISIS in Syria and Iraq, whereas Associate Professor Haldun Yacinkaya at TOBB University in Ankara presented his study on social media trends vis-à-vis radicalization in Turkey. The social media study, published by ORSAM and Prof. Yacinkaya, demonstrated the rising trends in violent behaviour and how regional shifts in Syria and surrounding Turkey has impacted radicalisation. Based on social media data, the study emphasises on the fact that PKK and ISIS radicalization use similar methods of radical narratives while generating a race towards multi-extremism. Murat Yesiltas, Ditrector of Security Studies at SETA (Foundation for Political, Economic and Social Research) analysed ISIS in Turkey and the surrounding area, noting that the terrorist organization – and its youth recruitment strategies – were based far more on social, psychological and economic factors, in contrast with simple religious narratives. John Gatt Rutter, Head of Division for Counter Terrorism Team at EEAS spoke about the urgent need for improved cooperation in the fight against terrorism. PKK in Europe: operational alarm bells? Jean Paul Rouiller, Director at the Geneva Center for Training and Analysis of Terrorism (GCSP) spoke about the rising dangers of the PKK with an emphasis on his field experience within the Swiss intelligence community. Several speakers pointed towards the urgent need to tackle radicalisation across European communities, while citing on-the-ground and operation-level concerns about communities with strong mobilization and structural capabilities that include PKK and ISIS sympathiser cells. The speakers agreed that recent developments in counter terrorism talks between the EU and Turkey would play an important role in preventive measures against terrorism, both in Turkey and across the European Union. Civil society finds its voice in counter-terrorism. The primary objective of the event was to incorporate a diverse and multi-faceted layer of Turkish and EU government speakers, academics, and civil society experts to start an open and transparent dialogue on shared threats, cooperation and counter terrorism. ‘Roundtable style’ contributions from the audience played an important role in the two-panel session, which lasted for over four hours. 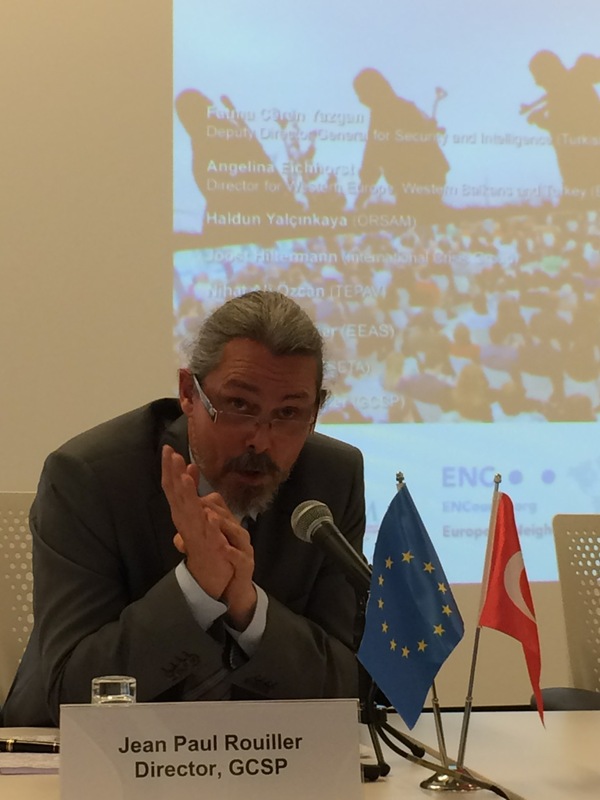 Over 60 participants – ranging from EU officials and diplomats to academic researchers and members of the press – contributed to prevent further radicalisation and violent extremism, including TurkishEU cooperation on the subject.